I'm starting this nifty project a week late - 52 Ancestors in 52 weeks. It seemed like starting with my great grandfather, Frank Gilmore Jones, was as good a place as any. 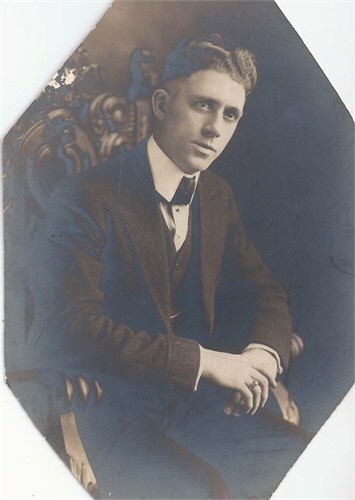 Frank Gilmore Jones was born on September 14, 1891 in Jefferson, Ohio to Thomas & Catherine (Farley) Jones. He married Anna Miller on April 19, 1915. He moved to Michigan in 1967 to live closer to my grandfather, Robert (his only child), and died on February 24, 1970. I don't have any great stories about him from dad, who told me the other day that he met Frank maybe 4 times during his childhood. I do, however, have tons of articles that were cut out of newspapers and put in a photo album about his career (some of which I haven't scanned in yet... really need to do that)! He was a successful lawyer in Ohio from 1930-1960. In 1938 he was appointed as City Relief Commissioner (which he served from 1938-1948) and a member of the Knights of Columbus and the Fraternal Order of Eagles. He was definitely not the kind of guy who just sat around. I'd even venture a guess that he was a bit of a workaholic - considering my grandfather was a bit of a workaholic. My goal for the rest of this week is to rummage through old family photos and see if I can find more of Frank. At the very least, scan the rest of his news articles! Really? Could these copies be any worse?!? So, naturally, I ran straight to the Google machine. Long story short... I found Wolfe-Sill Realty Co in a city directory... AND a 1910 postcard with the building on it! AND I got to share the excitement of this discovery with mom! :D Only she understands getting excited about finding a photo of an old building. Oh, I understand that excitement at finding something cool -- a draft card, a city directory listing, a photo. Newspaper articles are even better!